Among New York’s many commercial galleries, there are group shows and then there are group shows, veritable extravaganzas that give the genre all they’ve got. These exhibitions are immersive and often densely packed; they can require of viewers the same stamina as museum shows (and often as much effort on the part of their organizers). They reach into the past or focus on other cultures. They show us the art of our era in new thematic arrangements, or the art of this-very-instant, from unfamiliar creators. Here are four of the city’s most energizing and eye-opening group shows, with subjects stretching from fantastic art of the sixteenth century to contemporary assemblage from Port-au-Prince, Haiti. Each creates its own world, full of surprises and multiple rewards. In sheer wall power and rare historical gems, “Endless Enigma: Eight Centuries of Fantastic Art,” a two-floor, 130-work exhibition at David Zwirner exceeds the “museum-quality” designation and edges toward once-in-a-lifetime status. For one thing, when will another Chelsea art gallery present a combination of old and modern masters that includes Titian, Piero di Cosimo, Salvator Rosa (a naked witch), Jan Bruegel the Younger, Gustave Moreau, James Ensor, Odilon Redon, Max Ernst (three great canvases), and a follower of Hieronymus Bosch? 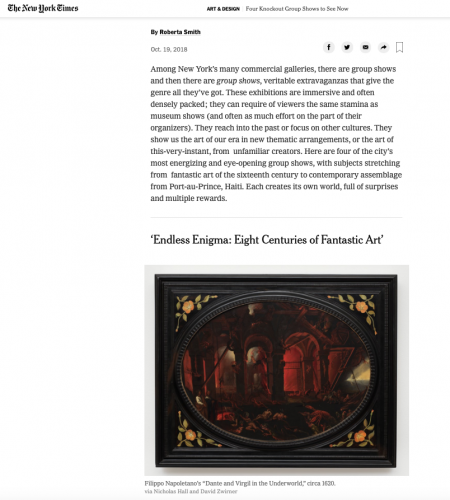 The show has been selected to enhance unexpected connections by its organizers, David Leiber, a partner at Zwirner, and Nicholas Hall, a specialist and dealer, in European art. (Yes, some of the works are also for sale.) The curators were inspired by the Museum of Modern Art’s voluminous 1936 exhibition, “Fantastic Art, Dada, Surrealism,” with which their effort shares nearly 20 artists — but it has taken a much more focused view. No Dada, for one thing. What the early 20th century finally labeled “Surrealism” has come to include the uncanny, unfathomable and disturbing. The through line here, for the most part, is the human body and what the human imagination has made and continues to make of it. (Living artists include Lisa Yuskavage, Sherrie Levine and Robert Gober.) We see bodies — ideal and not, and those of other species. Get ready for demons — the temptation of St. Anthony is a recurring theme — and violent historical fact: Kerry James Marshall’s discretely bloody “Portrait of Nat Turner With the Head of His Master” (2011) vividly conveys the fury of the act and, more gripping, the perpetrator’s consciousness of what he has wrought. Nearly everything here is worthy of close study, so recommendations seem unfair. But please don’t miss Paul Klee’s gorgeously ominous “Black Herald” of 1924; a wonderful Klee-like painting of an abstracted garden made in 1949 by the young Antoni Tàpies; and a little painting from around 1906 by José Gutiérrez Solana, of masked street musicians that echoes back to Redon’s spooky canvas, “The Angel of Destiny,” from around 1900. Also don’t miss two small detailed paintings by unfamiliar artists: “The Cause of Thunder,” a green succulent landscape from 1965 by Richard Humphry, an American Surrealist born in 1942, and its neighbor, Filippo Napoletano’s “Dante and Virgil in the Underworld,” from around 1620, in mostly dark red on slate, which merges Bosch and Piranesi. The indisputable centerpiece is a copy of Bosch’s “The Garden of Earthly Delights,” from around 1515. In this panoramic vista of humans, animals, birds, near-humans and strawberries, a gastronomical delicacy of the time, the pleasures depicted are often perverse, humiliating and painful, as befits the human condition. As “earthly” implies, Bosch seems to depict a world where God is absent and humans, subject to irrational forces within and without, are left to their own devices. On a recent Saturday, Mr. Hall drew a small crowd when examining the painting with a conservator. He said it is assumed to have been made with Bosch’s permission, perhaps by someone working beside him as he painted his masterpiece. Proof: the drawing beneath the copy is schematic yet accurate, evidently derived from a tracing of the original.